The annual Outdoor Retailer Snow Show in Denver is the largest outdoor trade show in the United States, a playground for outdoor gear companies showcasing what’s on tap for 2019 and beyond. Though this year’s event was largely dominated by the latest in skis, snowboards and soft goods, there was no shortage of auto-related adventure gear. Even Ford Motor Co. made its Outdoor Retailer debut, showing up with the 2019 Ford Ranger to highlight its partnership with Yakima. Trucks.com navigated the crowded Denver Convention Center in search of the best upcoming auto gear and accessories. 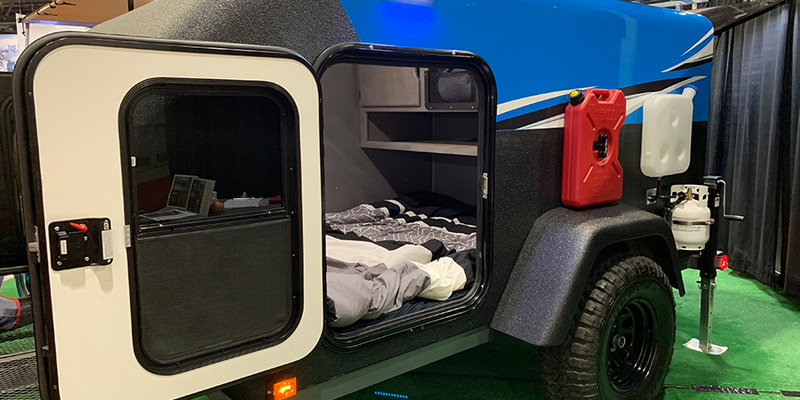 From innovative roof rack systems to custom teardrop trailers, here are the five standout products and companies from the 2019 Outdoor Retailer Snow Show. Houston-based travel trailer company Taxa Outdoors brought the Mantis, its largest trailer to date. Measuring 19 feet long and weighing 3,020 pounds, the Mantis sleeps up to four adults and can be stored in a standard garage. Inside, the trailer has a queen-size bed, a birch-wood kitchen, a Dometic stove/sink combo and Dometic refrigerator, a dinner table, and wet bath with cassette toilet. It also features LED lighting throughout, along with USB ports for charging electronic devices and storage areas under the bed and in the kitchen. The exterior is finished with UV-treated aluminum panels, a powder-coated steel frame and gravel guards, and tinted windows. It comes standard with all-terrain tires, along with a 15-inch aluminum spare, a pop-up roof, exterior shower hookups, a patio awning and wiring for solar power. The roof can accommodate a roof basket or rack system for extra gear storage. Known primarily for its lineup of hitch- and roof-mounted bike racks, Kuat introduced its first ski-specific rack, called the Grip. 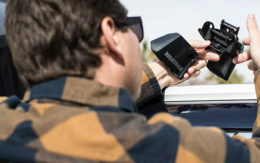 Featuring a slide-out design, the Grip is designed to make loading or unloading skis and snowboards more manageable, especially on taller vehicles. Each arm slides out from the crossbar-mounted rack to bring the load area away from the car’s roof. Once skis or snowboards are loaded, it slides back into itself, allowing the top clamp to lock into each arm. The Grip also has Kuat’s tacky GripLock rubber on each arm to securely hold skis or snowboards, regardless of size. Designed to hold up to wind, snow and moisture, the GripLock pads are tacky enough to withstand someone physically pulling on locked gear. The 4-Ski Grip costs $349, while the larger 6-Ski version runs $398. What sets High Altitude Trailer Co. apart from other trailer manufacturers is its use of a foam core composite shell. With each trailer covered entirely in a 1.25-inch-thick foam, the shell is 100 percent waterproof and offers a strong insulation factor. Its flexible panel sealant also helps it stand up to rough off-road driving. High Altitude offers several customization options depending on the trailer’s intended use. This covers a variety of interior cabinet and shelving options, a rear galley-style kitchen with room for a two-burner camp stove and refrigerator unit, as well as a queen-size bed. Regardless of the interior setup, the cabin height is 4 feet, 4 inches tall, which is just high enough to sit up in bed. Its 5-foot width also allows two people to sleep comfortably side by side. Pricing options vary depending on the customization. Dario Diaz, the company’s head of research and development, told Trucks.com it will soon offer package options. Designed in South Africa, the LockRack is engineered for versatility. With a single rack system, owners can swap out components capable of securing surfboards, paddleboards, kayaks, skis or snowboards. The system uses rubberized, lockable bars that snap in and out of the rack’s crossbar via an easy-to-use locking mechanism. Each bar slides completely out of the rack, allowing users to switch between arm sizes for various gear. When not in use, the arms can be adjusted to lay flat or completely removed for storage. Van life is booming, and Outdoor Retailer is a haven for the budding lifestyle. This year, Missouri-based Vandoit displayed its approach to allowing van lifers to not only live in their vans for extended periods of time, but to also use them as functional daily drivers when back on the grid. Called Do, the system leans on an open floor plan consisting of an internal track system. With hundreds of attachment points throughout the van, it allows for custom placement of racks, cabinets, shelves, tie-downs or mounts. Do features a drop-down bed that folds out from the wall and can function as a table without the mattress. Removable seats hold up to 11 passengers, and the rear storage area has an electronics system for portable power stations, refrigerator units or inverters. Vandoit told Trucks.com its builds run anywhere from $38,000 to around $85,000 total for the van and conversion. Currently it supplies and converts Ford Transit vans. Box Battery vs. Dual Batteries: What’s Best for Your Travel Van?